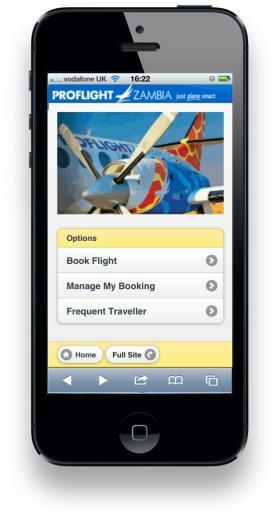 Passengers have full access to your system allowing them to booking flights on the go from any smart phone device. The mobile application is integrated to deliver flight availability and fare prices that are right up to date in real time so your customers are only offered seats that are available at the current selling prices. Returning passengers can access their existing bookings and make changes. Once logged into their booking they can change their flights, add ancillary products to the booking and even select seats. This gives you the opportunity to sell additional value added products to the passengers or allow them to change their flights which may include change fees - all additional revenue for your airline. Allow passengers to create and use profiles to complete bookings. Integrated with the Frequent Traveller database all passenger details can be stored and recalled for use when returning to book flights. By giving your customers this additional level of service to keep a profile you can also use the data stored for marketing campaigns and sales reporting tools. Passengers are provided a very easy to use search panel that allows them to search for flights in real time directly from your core reservation system. All the objects in the application work across any platform tested extensively by Videcom engineers. The mobile application will automaically load up all cities (airports) where the core database has flights to and from to ensure that the passenger is only given the option to select relevant city pairs. The passenger then selects the flights from the drop down menus which are loaded in the smart phones format. Lastly the customer will enters the number of Adults, Children and Infants into the search panel so the the mobile application will only search for flights where there is enough availability for the number of passengers in the group. The system will display to the customer all available flights within the date ranges searched for and will show the flight times. 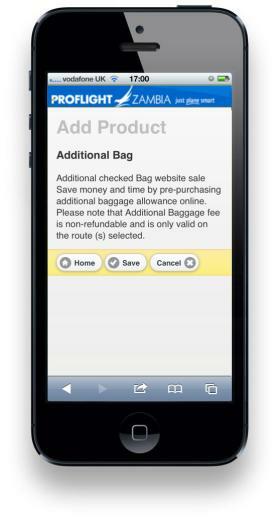 A selection button is located next to each flight for the customer to easily select the required flights. Prices are shown adjacent to each flight displaying the lowest available fare and the name of the fare type. In addition the customer can select from a drop down and the application with further diplay all available fare types for that flight providing that there is inventory avialable in the system to sell those products. A earlier / later toggle aloows the customer to move onto the previous and next days flights with ease without have to return to the main search panel and search again. After the flights have been selected on the previous page the application gives the passenger option of booking ancillary products to go with the booking. The application will load up all the ancillary products that have been loaded to the core system which aloows the airline to control all content being sold. Products may range from Excess Baggage, Travel Insurance, Airports Transfers and excursions - there is no limit to the number of products offered which gives you the chance to up sell and create additional revenues. The last stage of the mobile booking application requires the customer to add in all the passenger names, phone numbers and email adress which will be stored in the booking in the central reservation system together with all other bookings. Ticket Time Limits - This allows passengers to reserve seats for a flight and make payment at a later date. If the payment is not received by the central system the seats will be returned to inventory and the flight segments cancelled from the booking. Micro Finance Options - Generally known as mobile payments this is very useful in developing markets where bank accounts have low presense, but mobile and other service providers allow customers to use their accounts to make payments for airline tickets. Videcom have intgerated with many such payment providers and have a flexible interface which allows new payment options to be added. The passenger will also receive an automatic email confirmation with more booking details as well as an SMS if they chose that option.